Season all sides of the pork with BBQ Seasoning Blend. Add the sliced onion to the slow cooker. Pour in the cider, water, vinegar and Worcestershire sauce. 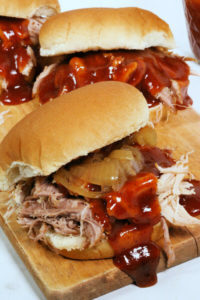 Shred the pork, top with Cider BBQ Sauce and cooked onions and serve on buns.